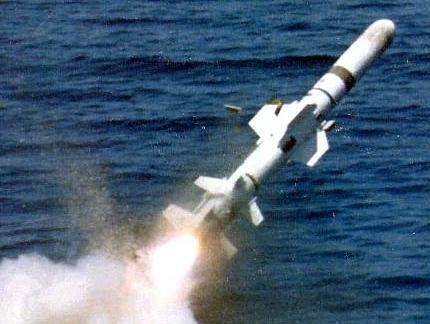 The Harpoon is the only dedicated anti-ship missile in service with U.S. armed forces. It has been developed into several advanced versions, including the SLAM (Stand-off Land Attack Missile) derivatives for high-precision attacks on land targets. The Harpoon and SLAM will remain in service with the U.S. Navy for the foreseeable future. In 1965 the U.S. Navy began studies for a missile in the 45 km (25 nm) range class for use against surfaced submarines. The name Harpoon was assigned to the project (i.e. a harpoon to kill "whales", a naval slang term for submarines). After the sinking of the Isreali destroyer Eilat in 1967 by Soviet-built anti-ship missiles, the U.S. Navy saw the need to develop a dedicated anti-shipping missile, and therefore Harpoon's primary mission became surface ship attack. The development project was formally begun in 1968, and the missile designator ZAGM-84A was allocated in 1970 after the Navy had issued a formal RFP (Request For Proposals). In June 1971, McDonnell Douglas was awarded the prime contract for Harpoon, and the first test missile flew in October 1972. By that time it had already been decided to develop air-launched, ship-launched and submarine-launched Harpoon variants, designated AGM-84A, RGM-84A and UGM-84A, respectively. Because the range requirement was increased to 90 km (50 nm), turbojet propulsion was selected by McDonnell Douglas. Production of the Harpoon began in 1975, and the first version to enter service was the shipborne RGM-84A in 1977, followed by the AGM-84A on P-3 aircraft in 1979. The UGM-84A became operational on attack submarines in 1981. There are also unarmed training versions of the AGM/RGM/UGM-84A, designated ATM-84A, RTM-84A and UTM-84A. The Harpoon missile is powered by a Teledyne/CAE J402 turbojet in an A/B44G-1 propulsion section, giving it a maximum range of about 185 km (100 nm) for the air-launched version. For surface launches, RGM/UGM-84 variants use a solid-fueled rocket booster in an A/B44G-2 or -3 booster section, which is discarded after burn-out. Maximum range for surface launches is around 140 km (75 nm). After launch, the missile is guided towards the target location as determined by the launching aircraft or ship by a three-axis Attitude Reference Assembly (ATA) in an AN/DSQ-44 guidance section. The ATA is less accurate than a full-fledged inertial system, but good enough for Harpoon's range. For stabilization and control, the AGM-84A has four fixed cruciform wings (3x BSU-42/B, 1x BSU-43/B) and four movable BSU-44/B tailfins. The missile flies at a low cruise altitude, and at a predetermined distance from the expected target position, its AN/DSQ-28 J-band active radar seeker in the nose is activated to acquire and lock on the target. The radar switch-on distance can be set to lower or higher values, the former requiring a more precisely known target location but reducing the risk to be fooled by enemy ECM. An alternative launch mode is called BOL (Bearing-Only Launch). In this mode, the missile is launched in the general direction of the target, and its radar activated from the beginning to scan for the target in a +/- 45° sector in front of the flight path. Once a target has been located and the seeker locked, the xGM-84A missile climbs rapidly to about 1800 m before diving on the target ("pop-up manoeuver"). The 221 kg (488 lb) WDU-18/B penetrating blast-fragmentation warhead (in the WAU-3(V)/B warhead section) is triggered by a time-delayed impact fuze. When no target can be acquired after radar activation, the Harpoon will self-destruct. The RGM-84A is usually fired from MK 140 (light weight) or MK 141 (shock-hardened) canister launchers, which hold four missiles, but older MK 112 (ASROC) or MK 26 (Standard) launchers can also be used. The RGM-84A has folding wings and fins which flip out immediately after exit from the launcher. For target acquisition and tracking, Harpoon-equipped surface ships use the AN/SWG-1 Harpoon Fire Control System. For launch from submarines, the UGM-84A is enclosed in a capsule, which glides to the surface after launch from the torpedo tube. When the capsule breaks the surface, the front and end caps are ejected and the missile fired. The digital MK 117 Fire Control System has full support for Harpoon integrated. The UGM-84B is a UGM-84A variant for use by the Royal Navy, and flies at a slightly lower cruising altitude than the -84A. The UGM-84B is called GWS-60 by the Royal Navy, and the UTM-84B is the corresponding training version. Interestingly, the designations AGM-84B, RGM-84B, ATM-84B and RTM-84B were also formally allocated, although no air- or ship-launched -84B missiles were ever built. The next U.S. Navy variant was the Harpoon Block 1B, designated AGM-84C, RGM-84C and UGM-84C. The Block 1B missiles were first delivered to the Navy in June 1982. The xGM-84C flies at the same lower cruise altitude as the UGM-84B, and does no pop-up manoeuver, flying a sea-skimming attack profile instead. The Block 1B training missiles are the ATM-84C, RTM-84C and UTM-84C. In 1985 the Block 1C version of Harpoon was introduced, being designated AGM-84D, RGM-84D and UGM-84D. The Block 1C has increased range (AGM-84D maximum range is quoted to be 220 km (120 nm)) by using JP-10 instead of JP-6 jet fuel. The terminal attack mode of the xGM-84D is selectable (pop-up or sea-skimming), and the missile also has improved ECCM equipment. Ships equipped with the improved AN/SWG-1A Fire Control System can program several way-points into the flight path of the missile before launch. Using this feature, the RGM-84D will fly an indirect path to the target area, thereby concealing the position of the launching ship. As with the earlier versions, there are also ATM-84D, RTM-84D and UTM-84D training missiles. The CATM-84D is a captive-carry training missile. The CATM-84D-1s are converted older ATM-84As, and CATM-84D-2s are improved new-built missiles. The AGM-84E Harpoon Block 1E SLAM (Stand-off Land Attack Missile) is essentially a new missile. It is a high precision land-attack missile, which combines the airframe, engine and warhead of the anti-ship Harpoon with the WGU-10/B IIR seeker of the AGM-65D Maverick and the data link of the AGM-62 Walleye. Development of SLAM began in 1986 as an interim precision-attack missile pending delivery of the AGM-137 TSSAM (Tri-Service Standoff Attack Missile), and the first all-up AGM-84E rounds were delivered in November 1988. SLAM became operational with the U.S. Navy in 1990, just ready for a few missiles to be used in action in Operation Desert Storm in early 1991. After the TSSAM was cancelled in 1995, the importance of SLAM increased significantly. The AGM-84E flies a complex path to its target using its inertial system, and during the final 60 seconds of the flight it is controlled through the data link (using an AN/AWW-13 pod on the launching aircraft) using imagery from the IIR seeker. The WDU-18/B warhead is in a new WAU-23/B warhead section with an (optionally delayed) impact fuze. Non-tactical versions of SLAM include the ATM-84E training missile, CATM-84E captive-carry variant, DATM-84E ground handling trainer, and the NAEM-84E test and evaluation missile with special telemetry equipment. A ship-launched version of SLAM, to be designated RGM-84E Sea-SLAM, was also tested, but production was cancelled. The next version of the Harpoon anti-ship missile was the Block 1D, designated AGM-84F and RGM-84F. The Block 1D missile was longer and heavier for a significant increase in fuel load and flight duration. Because the increased length prevented the use from submarines, there was no "UGM-84F". The longer duration not only increased the missile's range, but also allowed the integration of a re-attack capability. When the radar seeker could not acquire a target after being switched on, the xGM-84F would fly a cloverleaf-shaped search pattern trying to detect the target until fuel exhaustion. Development of the Block 1D started in 1989, and the first missile flew in September 1991. Although it was planned to convert many Block 1C missiles to Block 1D standard, the program was cancelled in 1993. The AGM-84G, RGM-84G and UGM-84G Harpoon Block 1G is an upgrade of the xGM-84D Block 1C, the main new feature being the re-attack capability of the xGM-84F Block 1D. In addition, the Block 1G has also further improved ECCM capability. Block 1G missiles will be produced by converting older Block 1C rounds. The AGM-84H SLAM-ER (Stand-off Land Attack Missile - Expanded Response) is a much improved AGM-84E. Development began in 1994, and the first flight test occurred in March 1997. The first production missiles were delivered to the Navy in April 1998, and IOC (Initial Operational capability) was eventually reached in March 2000. The most prominent new feature of the AGM-84H are the pop-out swept wings (similar to those of the RGM/UGM-109 Tomahawk), which significantly increase the missile's range and manoeuverability. The new AN/DSQ-61 guidance section includes the computers, the inertial system, and the new multi-channel GPS receiver. The data link has a longer range and is more jamming-resistant. Software upgrades in the WCU-24/B control section make it easier for the operator to direct the missile to the selected target, and also introduce such features as target switching immediately before launch and search-while-track mode to search for a better aim-point without breaking lock on an existing one. The IIR seeker is hardened against laser countermeasures and last but not least, the AGM-84H has a much heavier 360 kg (800 lb) WDU-40/B penetrating blast-fragmentation warhead in a WAU-30/B warhead section. Training versions of SLAM-ER are the ATM-84H (with AN/DKT-81 telemetry equipment), CATM-84H and DATM-84H. As early as 1996, McDonnell Douglas proposed the "Harpoon 2000" improvement, later evolving into the Harpoon Block II. Suggested Block II features included a GPS-aided INS, a radar seeker with improved ECCM and some SLAM hardware. The GPS/INS guidance would allow much higher precision in attacks on shore-based targets. The "Harpoon 2000"/Block II proposal was apparently not too well received by the U.S. Navy, and no development order came forward. However, Block II was developed for export as AGM/RGM-84L, q.v.. In February 2008, the designations AGM-84J and RGM-84J were retroactively allocated to Block II conversions based on the AGM-84D. The AGM-84K is an upgraded variant of the AGM-84H SLAM-ER with internal improvements. Developmental tests of the hardware and software updates of the AGM-84K were conducted in early 2001, followed by operational test and evaluation in the first half of 2002, and Initial Operational Capability in July 2002. Existing AGM-84Hs will be upgraded to AGM-84K standard. Training versions are the ATM-84K and CATM-84K. The latest upgrade of the AGM-84H/K SLAM-ER is the SLAM-ER ATA (Automatic Target Acquisition). This missile can be launched in the general direction of the target and will automatically select a target by comparing the stored reference image with the IIR seeker image without the need for operator intervention. However, the operator can take over control of the missile at any time in the mission, thereby retaining the capabilities of the basic SLAM-ER. The ATA system was released to the Fleet in 2002, and existing AGM-84H/K missiles will eventually be upgraded. Although the GPS-equipped Harpoon Block II was not ordered by the U.S. Navy, the missile was offered for export, and eventually ordered by several contries, including Egypt, the United Arab Emirates, Taiwan, and South Korea. These export missiles are based on the RGM-84G, and designated RGM-84L. Korea has also ordered the air-launched AGM-84L variant. In January 2008, the U.S. Navy awarded Boeing an SDD (System Design and Development) contract for the AGM-84M Harpoon Block III. The Block III upgrade includes the major Block II features like the GPS/INS guidance and a new seeker, and adds a two-way datalink. The datalink makes it possible to update the targeting information after launch and actively control the missile at all points of the mission. The Navy plans to acquire Block III upgrade kits for 850 Harpoon missiles, with IOC planned for 2011. The RGM-84M is the ship-launched variant of the Block III missile. More than 7000 Harpoon anti-ship missiles (including production for foreign countries) and 1000 SLAM variants have been built so far. Production of the anti-ship missiles continues for non-US customers, while productuon for the U.S. Navy will continue with the AGM-84K SLAM-ER ATA. Current U.S. platforms for the AGM-84 anti-ship Harpoon are the Navy's F/A-18, P-3C and S-3B and also a few B-52Hs of the USAF. The AGM-84E/H/K SLAM is mainly employed by the F/A-18, but has been used by the P-3C, too.